Northern catalpa is a medium-sized tree with a short trunk and several large, ascending branches and a narrow, rounded crown. Leaves are simple, opposite or in threes, egg-shaped with an abruptly pointed tip, 6–12 inches long, margin mostly smooth; upper surface dark green, smooth; lower surface paler, hairy; mildly scented when crushed; turn yellow in fall. Bark is thick, with irregular, short ridges and deep grooves, not scaly. Twigs are stout, brittle, green to purplish, hairy; becoming light orange or brown and smooth with age. Flowers May–June; in upright, pyramidal clusters 4–8 inches long; flowers bell-shaped, 2 inches long, white, showy, attractive, and fragrant; throat with yellow spots and dark lines; lower lobe with a notch in the center. Fruits October, single or 2 or 3 together, a beanlike pod 8–20 inches long, ¼–½ inch wide, light brown, splitting into 2 halves; seeds numerous, flattened, about 1 inch long. Pods persist on branches all winter, opening in spring before falling. Similar species: Southern catalpa (Catalpa bignonoiodes) is not native to our state but has been planted widely. Northern catalpa, however, has bigger flowers (1½–2 inches long); each flower’s lower lip is shallowly notched; the fruits are fairly thick-walled (the sides remain concave after the pod splits open); and the bark is reddish brown and divided into thick (not thin) scaly plates on older trunks. Northern catalpa has been planted widely and has become naturalized in many places. Occurs naturally in the Bootheel, in bottomland woods along streams and bases of bluffs, also in upland woods. Naturalized statewide; found in old fields, old homesites, and disturbed areas. Modern landscapers are not keen on this species because of its coarse appearance, "messy" bean pods, and objections to the catalpa sphinx moth larvae, which in some years can nearly defoliate a tree. Nevertheless, for difficult sites with poor soils, a variety of light conditions, hot weather, and low humidity, catalpa remains popular. Originally native to bottomlands and rich soils of southeast Missouri; now found throughout the state. 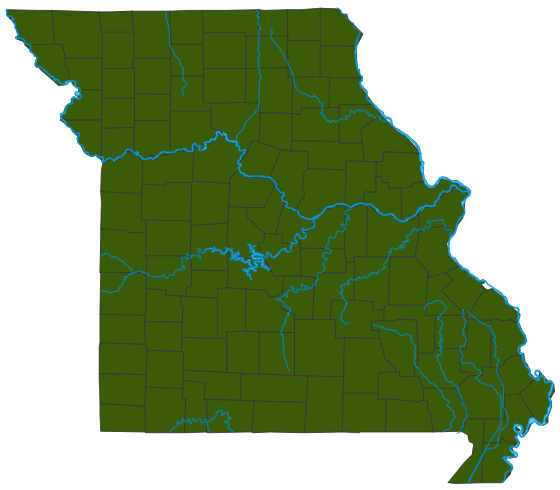 Native range includes eastern Texas to Oklahoma, Louisiana, Arkansas, Tennessee, Kentucky, Indiana, Illinois, and southeastern Missouri. Northern catalpa has been used as a windbreak planting, for fence posts, and as an ornamental or shade tree. It is reported that some people develop dermatitis after handling the flowers. Though some consider catalpa sphinx moth caterpillars a big problem, anglers appreciate the free bait! Catalpas are in the same family as trumpet creeper; note the resemblance in the trumpetlike flowers and podlike fruits. Catalpas are important hosts for catalpa sphinx moths, which in certain years can nearly defoliate the trees. Usually, though, parasitic wasps limit those hungry caterpillars.